The Tortilla Espanola is a great recipe to turn to when you want something special that’s relatively easy to prepare. In its simplest form it contains eggs, potatoes, onions, oil and salt. Variations can include seafood, sausage, or vegetables. This traditional Spanish food is one of my favorite potato dishes. This dish is great for serving to a lot of guests: it can be made inexpensively, and variations can satisfy even the pickiest eaters. Vegetables, seafood, or sausage may be added. 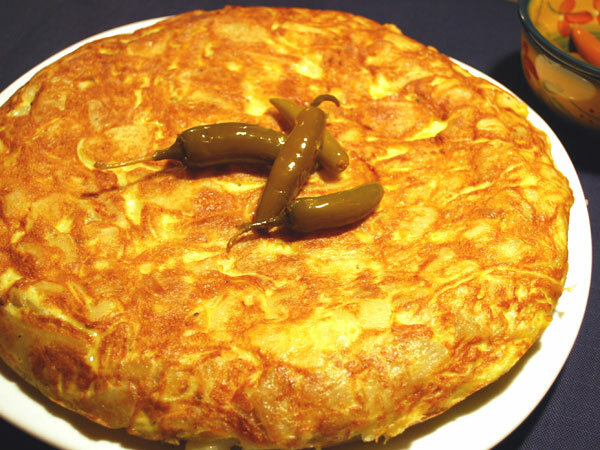 The basic recipe for tortilla espanola is common to many cultures. In Italy it’s known as Frittata con le patatine. I originally learned of it from a Mexican friend, who called it Tortilla de Papas, and taught me to eat it with chilis. I adapted this recipe from the Tortilla de Papas recipe in my favorite South American cookbook: The Art of South American Cooking , by Felipe Rojas-Lombardi. The cookbook has lots of gluten free foods in it. If you try the recipe, please leave a comment below. Peel potatoes, then quarter and slice thin. In a heavy skillet heat the oil over medium heat and cook potatoes about 15 minutes, until half done. Mix in salt and onion and cook until potatoes are tender. Do not brown. Transfer to bowl, leaving behind anything stuck to the bottom of the skillet. Beat eggs and mix into potato and onion mixture. Heat the non-stick skillet about a minute, then add the remaining 1T oil and coat the pan with oil. Pour in the potato/onion mixture and leave on high a minute or two. Lower heat to lowest setting and cook until set enough to turn, about 15 minutes. Slide the tortilla back into the pan, cooked side up, and cook over low heat 15 or 20 minutes until set. It should feel firm. Slide the tortilla onto a serving platter (or flip it again if you want). Serve with pickled hot peppers or something fresh like a salad for contrast. If you want to avoid confusion over how to flip a pan with a handle (especially if you have short arms like I do), and you happen to have a non-stick paella pan that’s not too big, I would use that. The handles are looped, so you don’t have to worry about the handle getting in the way when you flip the tortilla. I found a 12 Inch non-stick Paella Pan that would be perfect for the amount in this recipe. I don’t have one yet, but it’s on my wishlist! If you’d like to add seafood for a Tortilla Espanola con Mariscos: cut the potatoes back to 2½ lbs. Add 1 lb cooked scallops, shrimp, or crabmeat, (or a mixture) just before pouring it into the skillet. Here’s a great variation made with spinach and pine nuts: Sauté a lb of chopped spinach in a bit of oil or butter until wilted. Sprinkle with ½C pine nuts, and season with fresh ground pepper. Fold into the egg and potato mixture just before adding to the skillet. Note: Something to be aware of with some pine nuts. My husband has no food allergies that we know if, but he had a reaction to the pine nuts we used. Apparently some Siberian and Asiatic pine nuts cause a reaction in a very small percentage of people. Steve’s sense of taste was completely wacked out. For nearly 10 days everything tasted bitter, even things that should have tasted sweet. He was pretty miserable. It went away so we never found out if there could be any serious problems for anyone. Check out this blog post about it by someone with a similar experience.